Today I have been browing a bit and found a very interesting post on the MSDN blog talking about the Windows 2008 licensing model and how that connects to CPU models evolution during the last years. CPU terminology (Cores, NUMA nodes, Logical Processors) is so well explained I think you should really go and have a look. 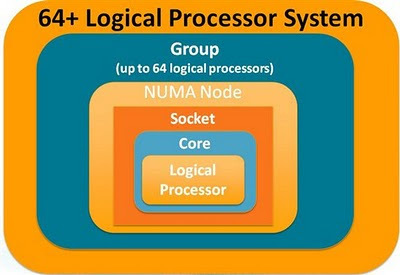 Also because most modern CPU’s, Intel new Nehalem’s and AMD’s veteran Opteron, are NUMA architectures whose characteristics are very well explained. Here's the link to the MSDN blog post.